Moleskine Cahiers are journals with heavy-duty cardboard covers, in black or buff with visible stitching on the spine. The last 16 sheets are detachable and there is a wide pocket for loose notes. 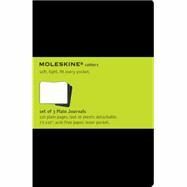 Each set of 3 journals includes the Moleskine history. Extra Large Cahiers: 120 pages, 19 x 25 cm (7 1/2 x 9'").Large Cahiers: 80 pages, 13 x 21 cm (5 x 81/4"). Pocket Cahiers: 64 pages, 9 x 14 cm (3 1/2 x 5 1/2").